Since the Final Fantasy games have been so incredibly influential, it's interesting to see where FF's designers have looked for their own inspiration. It's no secret that Final Fantasy has apparently been influenced by Studio Ghibli. 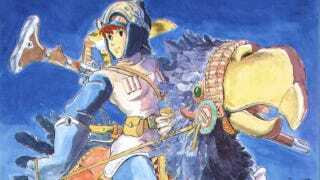 The Nausicaä of the Valley of the Wind manga, for example, most likely inspired Final Fantasy's Chocobo—those big yellow bird thingies. But that's not all. Final Fantasy IX seems to pay homage to Nausicaä. While recently playing through the game, eagle-eyed Kotaku reader George noticed how FFIX appears to reproduce a slightly tweaked castle design from the manga in the game. Final Fantasy IX, of course, was released after the Nausicaä manga wrapped up in 1994. This might be a coincidence, and it might not be. There's nothing wrong with borrowing from other creations if you make something your own—and Final Fantasy certainly stands on its own two feet.